Discover the exceptional movement and sparkle from the Rosabella Diamond hoop pendant. Crafted with three interlinked hoops, each separate section moves freely to reveal the sparkle from 0.45cts of dazzling white Round Brilliant cut Diamonds. Typically this pendant design is available from stock for immediate delivery subject to availability. Purchase within our showroom or online with free insured delivery. Crafted in luxurious 18ct White Gold, your completed pendant will be hand delivered by insured courier within a beautiful Serendipity Diamonds presentation box. Each Diamond set within the pendant achieves a Diamond grading of H Colour and SI1 Clarity for exceptional whiteness and clarity. We include a curb chain crafted in 18ct White Gold measuring 18" with your completed pendant. 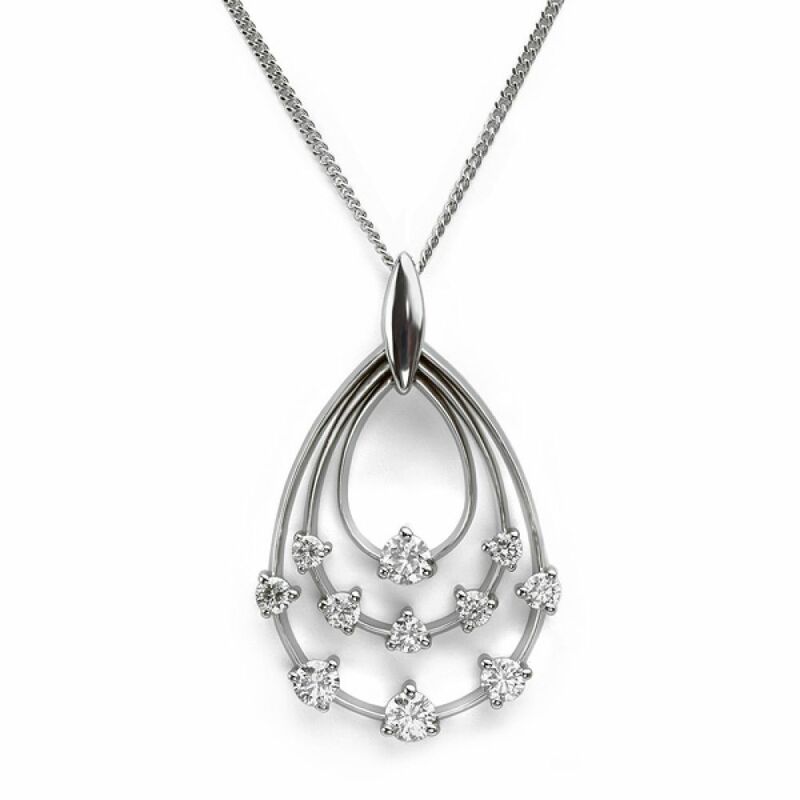 Please contact us for further information and advice on any of our diamond pendant designs. Also available to match are the Rosabella hoop earrings as shown below. Pendant measures 2.75cm in length x 1.8cm wide. If you're looking for the perfect pendant and earring set, why not consider adding the Rosabella diamond hoop earrings. This elegant matching earring design completes the look, offering a versatile drop earring design. Each earring is crafted in 18ct White Gold and set with a total of 0.50cts of dazzling white diamonds. Once your diamond pendant commission has been completed, we will send out your parcel by Royal Mail Special Delivery. This next day service delivers by courier before 1pm the following day. Once sent, your parcel reference is emailed to you. Diamond pendants are delightfully presented in luxurious packaging as shown below. Our main outer box is wrapped in a protective sealed wrapping to ensure your parcel arrives in box fresh condition. We also include certification where appropriate, and a detailed valuation within your document wallet. Besides exceptional value for money, we maintain strict standards for all of our diamond pendants and for the diamonds themselves. All diamonds are cut and polished to the highest standards. We provide a minimum of a very good cut grade as standard, with excellent cut diamonds being available upon request. Most certified diamonds are GIA certified for your reassurance, GIA is the most respected authority for diamond grading. All diamonds are provided with the assurance of being 100% conflict free, and we are now able to provide upon request fully traceable diamonds in certain sizes, colour and clarity grades. For 100% ethical assurance, consider Fairtrade Gold now available for diamond pendants. All diamond solitaire pendants weighing 0.30 carats and above, selected in grades above J colour and SI2 clarity will include full certification for your reassurance. Free insured next day Special Delivery sent from our ﻿UK showroom﻿. All pendants arrive with an 18 inch chain as standard. Other sizes are available upon request.